The UCLA Library recently launched a remarkable broadcast news research and education platform, Broadcast NewsScape. The service is accessible online to users on the UCLA campus. Platform managers hope to expand access throughout the UC system later this year. NewsScape captures closed captioning, in a manner similar to our TV News Search & Borrow, to facilitate deep search and discovery of relevant segments of over 200,000 U.S. and international news program episodes. 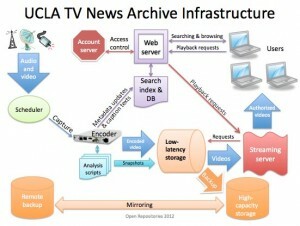 We are excited that the UCLA library has joined Vanderbilt University and the Internet Archive in offering tailored research and public interest access to television news. These successful demonstrations of responsibly providing public benefit access to television news are helping to enrich conversations regarding mutual benefits among media and library stakeholders. UCLA has a storied history in archiving television news, starting with the 1974 Senate Watergate hearings. Between 1979 and 2003, UCLA recorded off-air more than 100,000 news programs, preserving and making them accessible in UCLA’s Film & Television Archive’s News and Public Affairs Collection In 2005, Communication Studies department professors Francis F. Steen and Tim Groeling brought UCLA’s television news archiving into the digital age, recording direct to disks and, most transformationally, preserving available closed captioning. Their collection has enabled researches to experiment with new digital processes for analyzing attributes of broadcast news. Last year, the UCLA Library started making provisions to take the digital news archive under its wing, devoting considerable server resources and relieving Francis and Tim from their 8-year labor of love maintaining their modest, sometimes cantankerous, hardware and ever-growing data stores. Thanks to the leadership of associate university librarians Todd Grappone and Sharon Farb, the UCLA Library’s newly launched Broadcast NewsScape tool is welcoming scholars, educators and students from throughout the university to delve deeply and and derive new insights from the undiscovered country that is television news. This entry was posted in News and tagged digital library, Francis Steen, NewsScape, Sharon Farb, television news, television news archive, Tim Groeling, Todd Grappone, TV news, TV news archive, UCLA, UCLA Library, Vanderbilt University. Bookmark the permalink. When is the IA staff going to do something about the trolls in the Feature Film section who do nothing but create problems for the members who make positive contributions to the archive by uploading movies and monetary donations? It’s been going on for over a year and the staff does NOTHING about it and says NOTHING about it. Enough is enough. Please address the matter or I’ll suggest to the members who act in a civil fashion the boycott the archive fiscally. I’ll also suggest to them that they remove their movies and cease adding any more. We look forward to this problem being solved as soon as possible.